2015 is right around the corner. That is 8 years since the iPhone launched and changed our world forever. Believe it or not, there are companies out there without a mobile presence. Even worse, there are companies that don’t even have mobile on their radar in terms of a mobile strategy. Here are some of the risks of not having a mobile strategy. Users not only enjoy a mobile experience when they are browsing your site from their mobile device, they expect it. The majority of users will now be coming from a mobile device according to an article by Small Business Trends http://smallbiztrends.com/2014/07/online-traffic-report-mobile.html . 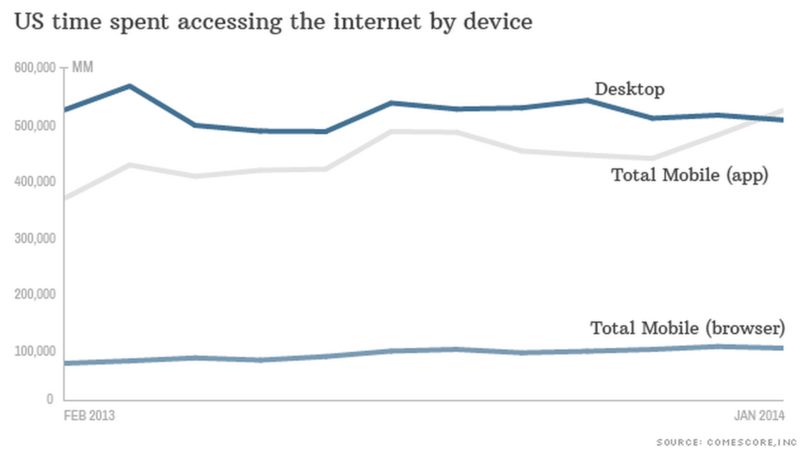 We are also seeing a rise in the traffic from mobile apps specifically over mobile web and desktop traffic. 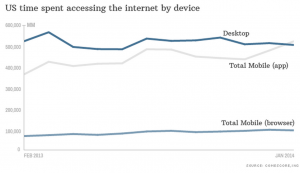 According to money.cnn.com , 55% of internet usage is coming from a mobile device. Of that, 47% of traffic is coming from mobile apps specifically. Users are clearly telling us that they want a mobile experience. Since so much of the traffic is coming from mobile devices, users will simply not consume, let alone buy your content if it does not fit the form factor they are browsing from. If users are not converting on your site due to a lack of a mobile experience or mobile app, where are they going? They are going to seek out your competitor who is offering this experience. They going to convert and use the app that feels most comfortable to them when they are looking for a vendor. With the alarming amount of sites and brands that are going mobile, customers have the ability to be choosey about sites they use, and they are choosing mobile. The final and worst risk organizations are vulnerable to with a lack of a mobile strategy is an increased churn rate. New leads and visitors to your site will leave if they don’t have an experience that suits their form factor. Unfortunately, the buck doesn’t stop there, existing customers will begin to leave as well. Even loyal customers will start to leave because they will see your organization as behind the times. In 2007 mobile was a new idea, but today it is a standard. 2015, is the year your company needs a mobile strategy if it doesn’t have one. Do you have any thoughts, insights or questions about developing a mobile strategy? Let us know in the comments.